"This is a steak we buy at the local Mexican store and season it with beer and sazon and grill it along with the tortillas. Serve with beans, rice, and tortillas. Use your favorite beer to make these; we use Corona®. Serve on warm tortillas with rice, beans, and salsa verde! " 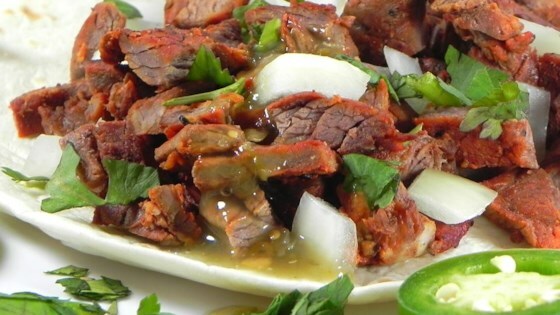 Sprinkle each piece of skirt steak with the sazon and white pepper. Stack the seasoned steaks in a deep dish as you season them. Pour the beer over the steaks. Cover the dish and refrigerate for 2 hours. Preheat an outdoor grill for high heat and lightly oil the grate. Remove the steaks from the dish and discard the marinade. Cook the skirt steaks on the prepared grill until they are very firm, hot, and gray in the center, 7 to 10 minutes per side.